LAS VEGAS – Bill Ratcliff, 57, is still reeling after a nasty incident at an ARIA poker table two weeks ago. Ratcliff was playing and enjoying himself in a $140 7 PM tournament, but in the course of getting into later levels, attempted to throw in a $100 ante chip out of turn. 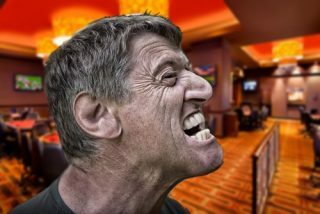 Much to Ratcliff’s dismay and confusion, ARIA is among a growing number of poker rooms utilizing the so-called “big blind ante” format, which antes for the entire table instead of individual antes. The format saves time in the aggregate, but Ratcliff’s experience illustrates that there are still significant kinks in the system. Sean McCormack, Aria’s Director of Poker Operations — who has received mostly positive feedback regarding the format change — brushed off the incident with Ratcliff. Ultimately, McCormack was forced to issue a penalty to Ratcliff for his use of profanity in the increasingly-heated conversation. After his tournament exit, Ratcliff vowed never to set foot in the mid-Strip casino again.